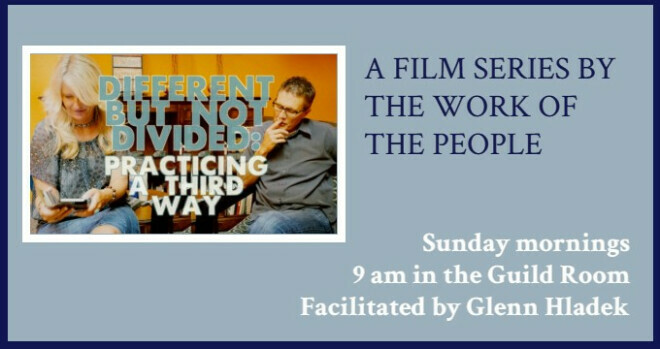 Join facilitator Glenn Hladek on Sunday mornings from 9:00 to 10:00 am in the Guild Room starting on November 4th. This series of films will lead us to consider living in the tension between our differences. Churches are closing every day. Beautiful important communities that are so desperately needed in a world thirsty for love and light are turning off the lights and closing their doors. When we love our theology more than we love our brother and sister, we either must grow into a large theologically homogeneous church or we close the doors and fall out of relationship with each other. Churches do not have the luxury of being and doing what we have always been and done. We must borrow from our technology friends in education, who cannot just educate folks for the present, but must prepare them for what will come in the future. This series of 6 films will lead us to consider a third way, to live in the tension of our difference and to allow us to be different but not divided. Please join us with your thoughts and your voice as we investigate and discuss this journey that lies before us.